Chon Ji Dojang is a community-based organization dedicated to the traditional learning of Taekwon-do, Hapkido and Krav Maga. Centered around respect for oneself and for others, Chon Ji Dojang provides a safe and non-competitive environment for people of all ages and abilities who wish to explore their interest in these martial arts. Our dynamic training regimen focuses on Mind, Body and Spirit with an aim toward developing self-confidence, discipline, positive character, and community service. 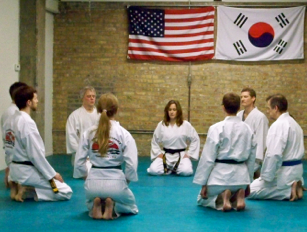 Chon Ji Dojang was founded in 2007 in Chicago’s Ravenswood neighborhood. It is a proud affiliate of Connelly’s Academy, which, under the direction of Grandmaster Joe Connelly, has been serving the North Shore Community for over 30 years. The United States Moo Sul Kwan Taekwon-do Federation and the World Hapkido Federation have recognized the Academy’s instructors as exceptional martial arts educators. Further, we host youth and adult violence prevention and self-defense workshops through the award winning international programs Kidpower, Teenpower, and Fullpower. Small class size ensures that every student receives close and personal attention during their training. Instruction at Chon Ji Dojang was led from 2006 – 2012 by its founders Mr. Sterling Goodrich and Mr. Iain Muirhead, who have over 30 years of combined experience in the martial arts. Presently all instruction is facilitated by Connelly’s Academy of Martial Arts under the direction of Grandmaster Joseph Connelly. Students often have the unique benefit of learning directly from Grandmaster Joe Connelly and his professional team of instructors who lead different training regimens and bring a diversity of insight to the classroom. Limited to Black Belts in the Taekwon-do and/or Hapkido programs. Keyholders are encouraged to use the space as a personal training facility and to set up informal training times with other Black Belt students. Any comfortable athletic clothing is appropriate for the first few classes. Eventually a training uniform (dobok) is required, which can be ordered from the dojang. Originating in Korea, this modern martial art is a mind body process of self empowerment and group responsibility. 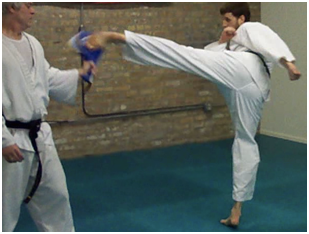 Our traditional study approach aims to develop a personal understanding of inherent physical power through rigorous repetition of dynamic kicking and striking patterns. Physical refinement framed within philosophical tenets guide more than just using force responsibly. Taekwon-do is a moving meditation actively directed toward developing healthy mind, body, spirit and character in class and out in the world. In Korean, hapkido means “way of coordinated power.” It is a comprehensive modern martial art offering thousands of techniques in striking, avoiding, joint manipulation, throwing, weapons, breathing, and healing. Practitioners use ideas about harmony, water, and the circle to redirect or blend with an opposing force. Safe training methods require controlled physical contact between partners, as well as falling and rolling on a padded surface. With devoted training, this art translates readily into practical self defense and is used widely by military and law enforcement personnel. Hapkido philosophy is ultimately directed toward a perfect harmony between mind, body, spirit, and character.